This lyrical work by Frederick Varley might belong to a group of works he painted at Georgian Bay, near the cottage of Group of Seven patron Dr. James MacCallum. Works by Varley from as early as 1915 show his interest in the pines that grew on the rocky isles and islets there. Wizened by time and the weather, their gnarled trunks and dancing boughs held Varley’s interest for some time; Stormy Weather, Georgian Bay, in the collection of the National Gallery of Canada, was painted in 1921. However, the inclusion of what appears to be a rough-hewn fence running through the work questions a Georgian Bay location, as fences are not common in this area. 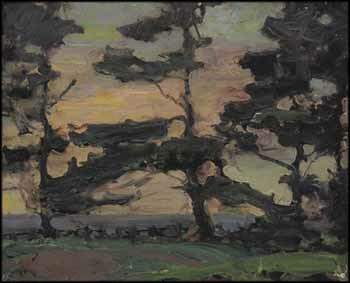 Regardless of location, the handling of Pines at Dusk owes much to the influence of Tom Thomson. Its fluid execution, contained energy and glowing light bring Thomson’s evening and nighttime works instantly to mind, but the palette and atmosphere are all Varley. Lush, velvety and saturated with dark, rich colour, Pines at Dusk is a fine example of Varley’s approach to painting the scenery of Canada.